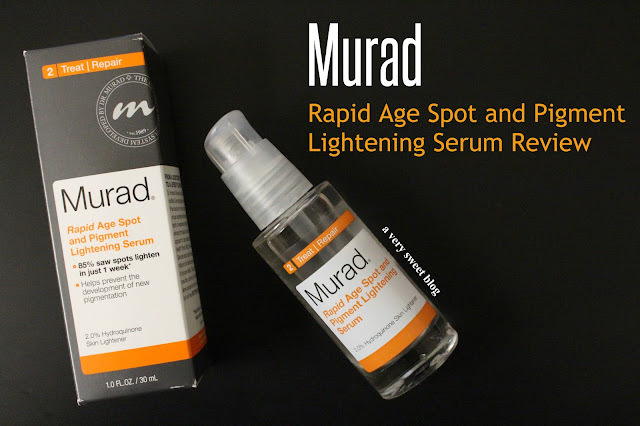 Press Sample - When Murad sent me a box of skincare goodies (over a month ago), THE MOST requested review was for Murad's Rapid Age Spot And Pigment Lightening Serum (hint: Andrea at Phd Fashionista asked, Does it work Kim? Let me know! ). This was also the most important item for me, because I had sun spots & dark pigmentation on both sides of my cheeks that I wanted to lighten. I've used various skin lighteners in the past and they would irritate my dry/sensitive skin, causing more redness, than lightening. I took a BEFORE picture, used the serum for a month and here's my AFTER picture (taken yesterday). IT WORKS! IT WORKS! That dark area on my cheek is really dissipating. I applied the serum once a day, only on the dark area of my cheek. So what about under my eyes? That area looked brighter to me also! All I can say is that for a month, I've only been using two things: Murad's Renewing Cleanser & the Rapid Age Spot and Pigment Lightening Serum. So the cleanser is also helping my overall skin tone (complexion). The serum is a clear gel with a light citrus scent. It creates a clear barrier over the affected area. This should not conflict with your makeup. While using this, I did not experience any redness or irritation. Since this does lighten spots effectively, only use it on your DARK AREAS. You can also see from my pictures, it doesn't get rid of freckles and really dark pigmented areas take more more time to dissipate. So I will continue to use this. I give this a Sweet (not Supersweet) rating, because I didn't see any fading of my freckles and my dark areas didn't lighten in a week (as stated on the package). I still have more Murad products to review, but I only wanted to use this (and nothing else) to see if it REALLY WORKED. I'm comfortable in saying it does, but it does take time. Take a before and after picture to see how it works for you! Pictures are better, because sometimes the naked eye can't catch the changes. This serum is not cheap ($60 USD), so I'm happy to say it works! HaHaHa Plus, a little goes a long way. Murad sent me an extra bottle of their Rapid Age Spot and Pigment Lightening Serum, so since it's THANKS-GIVING week, I would like to give it to one lucky reader of A Very Sweet Blog! I want to help someone else suffering from dark pigmentation. Use the Rafflecopter widget below to enter, it's open worldwide and Good Luck To Everyone! I can see a difference here. I've heard so many products of this nature that don't work, it's great to read this review. I can see a difference! Murad is definitely good. Murad products really works what a big difference I do not have spot but you never know in the future and I will have to keep this product in mind. The proof is definitely in the photos Kim. This product clearly works. I'm often vexed by hyperpigmentation. It's good know this product doesn't irritate dry and sensitive skin cause I've tried some treatments that have been a little harsh. Oh wow, the pictures clearly showed the results, Kim! That is honestly impressive and thank you for another wonderful giveaway, I entered not for myself but for my MIL. She would adore this product! It's good to know a product like this works. Thanks for the detailed review. I can see the difference. I've really been wanting to try this! I have some post acne marks that could use a little help going away. Everything from Murad works so well. It's such a great brand. Looks like it really does work. I think I'll have to enter so I can try it out! Wow, what wonderful results, your skins look beautiful. Great Results, thank you for sharing! Have a wonderful week! Me, me, me!!! I've been looking for a good serum forever and have freckles I want to go away. i'm glad this works and this is on my list! It works. There's a big difference there. Murad is really a good skincare brand. Wow I can see a huge difference! That looks like an amazing product and thank you for the giveaway chance! I have some stubborn dark acne spots I would love to lighten! Wow Kim the product really worked! Thanks for reviewing them! I would love to try the serum. I think that the fact that it works, makes the price reasonable - WOW I am really excited to see that it did so well. I can see the results.....great product. I have a lot of freckles on my face. I would love to try this serum to give me a clearer complexion. I'm so glad I read this Kim because I just started using the same serum. I have sun spots near my temples and I actually have been using it on my upper chest too where I've had sunburns and spots. I have used it for a week and already noticed very faint changes of it really working. I'm so surprised and love your review. It really does work, wow!! I also like that it feels so smooth and clean when I rub it on my skin. Happy Thanksgiving Kim! Good luck to whoever wins this. Having trouble with your instagram link saying that the page was not found!